Although mortgage rates are currently low, the nation’s home ownership rate is at 65.4%, the lowest it has been in 16 years. Homeownership is integral to the American Dream (polls show that it is important to 96% of Americans), however the recession led to reduced job security and lower salaries, pulling this dream out of reach for many Americans. NerdWallet took a look at over 100 U.S. metro areas to determine where homeownership is feasible for the average consumer. By dividing the home sale price by the median household income in each city, we determined how expensive homes are in terms of salaries. In South Bend, the average home costs just 1.5 years of a household’s pre-tax income, while in Honolulu a home price equates to almost 9 years of pre-tax income. This is a simplistic, back-of-the-envelope measure that does not take into account local tax rates, mortgage rates, credit scores or the ability to make a down payment, but the numbers show the relative difference between cities in home affordability. For more information, check out our cost of living calculator. 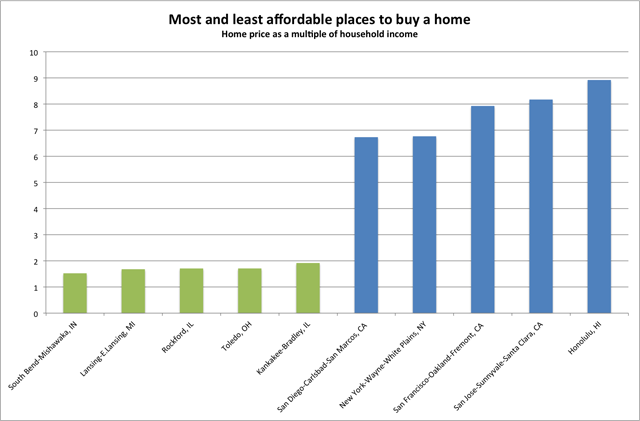 As a contrast, here are the least affordable places to buy a home.